EmcArts offers affordable webinars for practitioners interested in learning more about organizational innovation. For over ten years, our programs have equipped participants with rigorous frameworks and practical tools for innovation. We've heard from our community that you want affordable and accessible ways to experience our services, and our webinars provide exactly that, as well as a way to share our essential frameworks and tools with a broader audience online. These days, it’s a volatile, uncertain and complex world out there for the arts. To achieve our goals, it’s no longer enough to build on past successes, plan rationally, and bet on the future resembling the past. As organizational leaders and artists, we need a new mindset and different tools to succeed in these conditions, so we can do more than just react to unpredictable events. That means intentionally developing our organization’s adaptive “muscles,” building new capacities that we can rely on as staff, artists and trustees to address the complex challenges we face. At EmcArts, we’re all about supporting your work in strengthening and flexing the most important muscles for effective innovation and adaptive change. Over the last 12 years, we’ve found that there is a set of eight core adaptive capacities that matter most, and which you can intentionally develop. This new series of four 60-minute webinars will introduce the eight adaptive capacities, provide examples of each one in action, and offer practical tools you can use to strengthen them. With what you learn, you can become pro-active in addressing complex challenges, get ahead of the adaptive curve, and look forward to new levels of success. Is this series for me? If you work in the arts and cultural sector and are interested in organizational innovation, whether you're at a big museum, a community theater company, or a small collective or start-up, this series is for you. 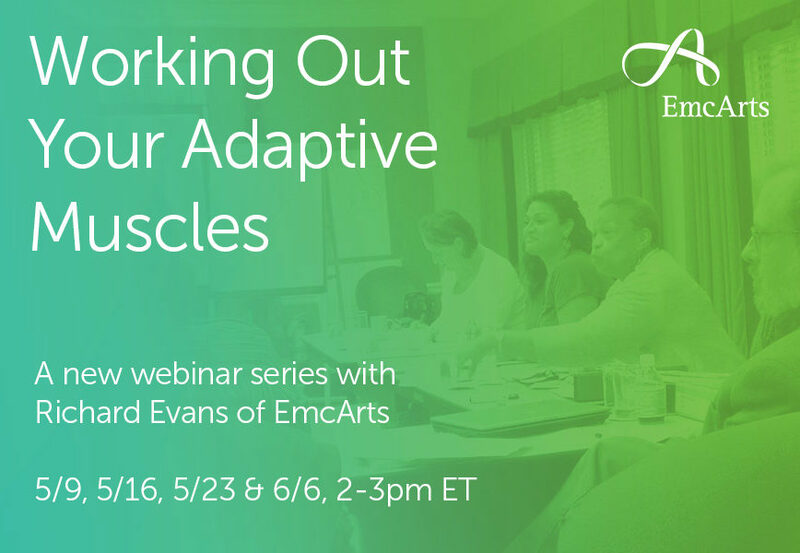 Each one-hour interactive webinar will be led by EmcArts President Richard Evans, and will feature conceptual frameworks, practical tools, and examples of adaptive capacities in action. Registration Sign up for the webinar series here! Purchase tickets to all four webinars at the discounted package rate of $125. How do we understand success when established indicators don’t apply? How can we open up our mindsets to craft innovative responses to the challenges we face? Our introductory webinar will focus on how organizations can set themselves up for success in cultivating an adaptive culture. How do we disturb entrenched cultural norms in our organizations, and move beyond a closed circle of expertise? How do we acquire the new, relevant knowledge we need to engage in this work? Our second webinar will cover strategies for breaking down traditional barriers and hierarchies, both within and beyond the organization. How do we know if a response to a challenge is truly adaptive? How do we actually implement these responses and learn from them? Our third webinar will focus in on the practical details of designing and carrying out multiple, divergent (even contradictory!) experiments. How do we preserve the structural flexibility we've worked so hard to create? How do we make space for new ventures in an organization with limited resources? Our final webinar will explore ways to make sure that adaptive work "sticks" in your organization.